The Gordon Elliott-trained Cause Of Causes created Cheltenham Festival history in the Glenfarclas Cross Country Chase as the gelding became just the fourth horse in Prestbury's Park rich heritage to win three different races in succession at The Festival emulating Flying Bolt, Bobs Worth and Vautour. Ridden by Jamie Codd on each occasion, the Irishman again gave the nine-year-old son of Dynaformer a superb ride as the pair quickened up well after the final flight to bound clear up the Cheltenham hill to score by nine lengths from stable companion Bless The Wings in second, with a further length and a quarter back to Enda Bolger's 9/4 favourite Cantlow in third. 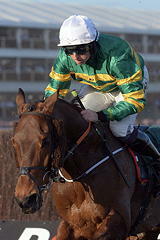 Codd and the J P McManus-owned gelding won the J T McNamara National Hunt Chase in 2015 before plundering the spoils in the Fulke Walwyn Kim Muir Handicap Chase at last year's Festival, with today's victory now taking his record at The Festival to three victories from four starts [second in 2014 Kim Muir]. A delighted Codd said: "Cause Of Causes has run at four Festivals - he's been second and had three wins, so he is a remarkable little horse, he is so durable. "He was second in the Kim Muir, won the four-miler and came back for a Kim Muir and has now won the Cross-Country race. He is a great little horse - he is just a dinger - and he has been marvellous for my career. "He ran here at January and had schooled well at home before, so we were quite confident but he just got a bit sticky early on that day. I got out of my ground and, to be fair, he only got going over the last three or four hedges across the side. "He finished OK that day but has been back since. He went to Punchestown and came here in February when the sales were on, so we had two good schooling days with him, and he schooled well yesterday and this morning. "If he turned up in the same form as the last couple of Festivals, I thought that he would run a big race. "He is an idle little horse, who only does what he has to in the race, but is very quick when you want him there. He has been second over two miles in a Galway Hurdle and a Ladbrokes Hurdle, so he is not slow either. He has just been fantastic. "That means a lot because I sit under John Thomas' (McNamara) peg and he was the king of the banks. It's my first win in the banks race and I am just delighted that he is looking down on us all and delighted to win it." Winning trainer Gordon Elliott, registering his fourth victory of the week, said: "He ran well and he may now go for the Randox Health Grand National." Winning owner J P McManus, registering his 51st Festival success said: "He's a lovely horse and I'm pleased." In a clean-sweep for horses trained in Ireland the Glenfarclas Cross Country Chase was dominated by trainers Gordon Elliott and Enda Bolger, and owner J P McManus. Elliott saddled the first and second, Cause Of Causes and Bless The Wings, while Bolger was responsible for the 9/4 favourite Cantlow, who finished third, and Auvergnat, an 8/1 shot who was fourth. McManus owned the first, third and fourth. Limerick-based Bolger said: "They ran up to form, but Cause Of Causes is a better horse, and now a three-time winner here, so I always knew that if it came to a battle he would keep going. "I think it was a very good race, but we were never in a position to boss the race, and Adrian [Heskin, who rode Cantlow] said he was always flat out. "Auvergnat will get the hang of this type of racing, and he stayed on very well. He's half the age of some of these horses - exactly half the age of Any Currency [finished ninth]. "They'll both go to Punchestown, and if Cause Of Causes goes to the Grand National instead that will help, but at least the green and gold [McManus's colours] won today and that's the main thing." Bolger will saddle On The Fringe in the St James's Place Foxhunter Chase on Friday, when the 12-year-old will bid to become the first horse to win that contest three times. Bolger said: "He's in great order, but he is 12 now. Wonderful Charm must be a big danger, but they're probably as afraid of us as we are of them."